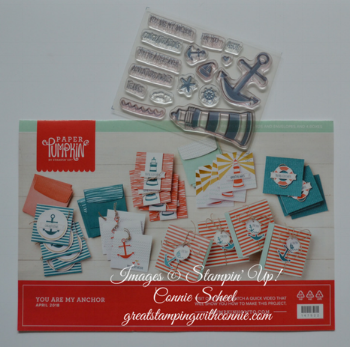 The April 2018 Paper Pumpkin kit You Are My Anchor is so much fun. I love all my Paper Pumpkin kits, it is fun to get a crafting gift delivered right to my door each month, but the April kit is really fantastic. These kits include all sorts of great pieces to create your projects, along with a stamp set and an ink spot. It is all cut and ready to go when the box arrives. You just open up the fun! It is easy to get your own, just follow this link! When I got the April kit I loved the stamp set as soon as I saw it. There are lots of supplies to make really cute 3 x 3 cards, along with boxes for them - perfect for gift giving! We all have friends that love and admire our cards, and this kit makes it super easy to create some cards to give as little gifts. Here are a few that I made, following the directions for this kit. I always like to start by making some of the cards exactly as the kit suggests, but I use more standard sized cards (5 1/2 x 4 1/4) so next I'm going to use all the fun pieces and stamps to make some alternate project cards. Bring on the summer weather, I'm ready!! !